The painting in Borneo, possibly depicting a native type of wild cattle, is among thousands of artworks discovered decades ago in the remote region. © Pindi Setiawan. TOKYO (AFP).- A painting of an animal in an Indonesian cave dates from at least 40,000 years ago, making it the world's oldest piece of figurative art, new research has shown. 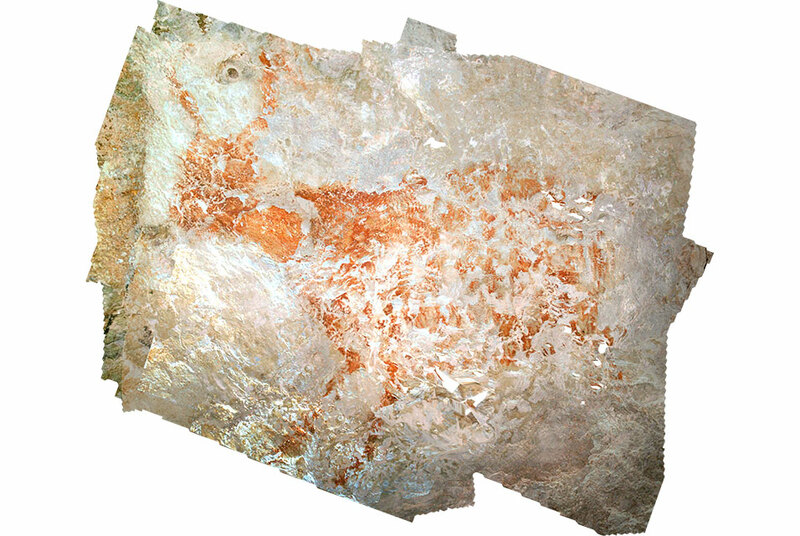 The painting in Borneo, possibly depicting a native type of wild cattle, is among thousands of artworks discovered decades ago in the remote region. But it was only using technology called uranium series analysis that researchers have finally been able to work out just when they were painted. The discovery adds to a growing body of evidence that cave painting did not emerge only in Europe, as was once thought. "We can see that figurative art developed and evolved more or less at the same time in Asia and in Europe," researcher Maxime Aubert told AFP. In 2014, researchers dated figurative art on the Indonesian island of Sulawesi to 35,000 years ago, but some of the paintings examined by Aubert and his team in nearby Borneo were produced at least 5,000 years earlier. Aubert, an associate professor at Australia's Griffith University, worked with a team in remote and inaccessible caves in the East Kalimantan area of Borneo to date the paintings. The team, whose research was published in the journal Nature on Wednesday, looked at multiple layers of artwork painted on top of each other. The bottom-most and oldest layer featured paintings of animals, mostly a local type of cattle, as well as hand stencils in a reddish colour. On top of those artworks were hand stencils in a mulberry colour grouped in patterns and embellished with lines and dots, as well as small stick-like human figures in the same colour. The final layer featured people, boats and geometric designs. Aubert and his team employed a technique called uranium series dating, which involves analysing layers of the mineral calcite that formed on top of the painting over the years, as well as the material underneath the art. They removed samples smaller than one centimetre (half an inch) across from the artworks and found one painting of an animal had been produced at least 40,000 years ago, and possibly nearly 52,000 years ago. "To our knowledge, the large animal painting... is the oldest figurative rock art image in the world," the team's study said. The painting is in fact one of the earliest-known representations of any kind of an animal, dating from a similar period to mammoth-ivory figurines found in Germany, the study added. For many years, cave art was thought to have emerged from Europe, where famed pieces have been discovered and dated in Spain, Italy and France. But the Indonesian paintings challenge that theory. "It now seems that two early cave art provinces arose at a similar time in remote corners of Palaeolithic Eurasia: one in Europe and one in Indonesia, at the opposite end of this ice age world," said Adam Brum, an archeologist involved in the study, in a press release issued by Griffith University. The second layer of artwork dates to around 20,000 years ago, and suggests an interesting evolution in the artwork of the era. "Around 20,000 years ago, painting becomes of the human world, not the animal world. We see the same thing in Europe at more or less the same time," Aubert told AFP. He plans to carry out further testing of other artwork in Indonesia, as well as pieces in Australia, and said he felt a personal connection to the past when examining the paintings. "It's amazing to see that. It's an intimate window into the past."